We love our pasta in our house. Riley normally doesn’t mind pasta. She won’t necessarily eat it if there’s meat in the sauce so I always make sure to make pasta and set it aside for her so she can have jarred sauce on top. I, on the other hand, enjoy a little variety. I grew up with my mom always making her own spaghetti sauce, but that was an all day affair. As you all know, I enjoy quick and easy. I went looking for a vodka cream sauce with sausage and came across this recipe from Emeril Lagasse. It sounded perfect so I decided to double the recipe and substitute what I didn’t have, which I thought was the crushed tomatoes. I simply used stewed tomatoes instead. As I was about half way through the ingredients, I realized I didn’t have any vodka. Um, fabulous. After eyeballing my liquor cabinet and running over to the neighbor’s house to no avail, I decided to go with Tequila Silver. 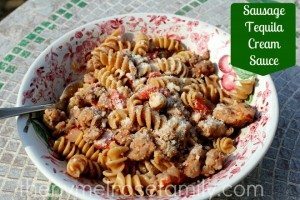 A sausage tequila cream sauce over rotini pasta. I have to say that this recipe was AMAZING. I like to think that it was largely due to the fact that I changed out the vodka for Tequila. All I know is that it was fabulous! Cook the pasta according to directions. While the pasta is cooking, remove the sausage from the casing and cook in the olive oil so that it is more like crumbled sausage. Once the pink is gone in the sausage, add in the onion, salt and red pepper. Cook until all the onions are soft and golden (about 5 minutes). Add the garlic and cook for about 30 seconds. Then add in the tomatoes and cook 2 minutes. Add the Tequila and cook for 3 to 4 minutes. Stir in the cream and cook until the sauce thickens (about 2 minutes). Toss the pasta with the sauce. Plate the pasta and top with Parmesan cheese and a sprig of fresh basil. I like how you improvised here! 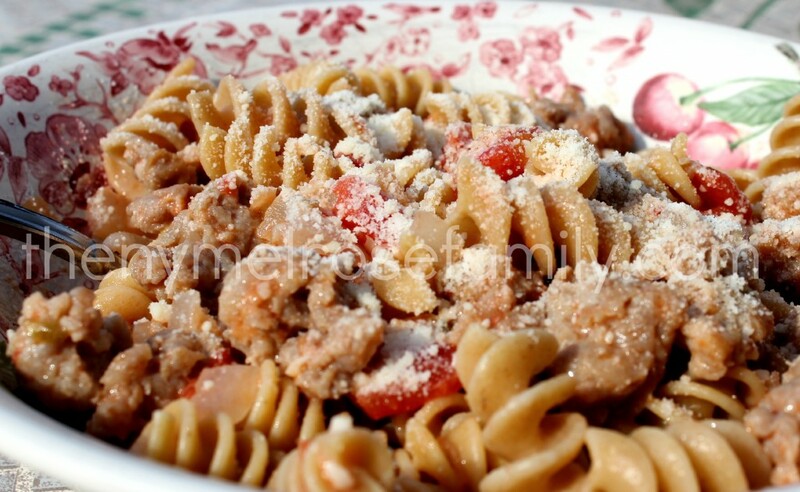 Your sausage tequila cream pasta sounds fantastic, and it looks delicious too. I simply want to tell you that I’m newbie to blogging and site-building and seriously liked your web-site. Most likely I’m likely to bookmark your site . You surely come with good well written articles. Thanks for sharing your web site. Yummy! I’m going to try this. Thanks for sharing at the All Star Block Party! Jenny, you know how to win over a girls heart. Anything with tequila has to be good! Thank you for sharing this at Mom’s Test Meal Mondays! I’m always looking for new ways to serve up pasta around here. Can’t wait to give this a try! That looks amazing! No one in our house eats pasta so I only get it when we go out. Maybe I can try this on a night when the boys are out! Thanks for sharing at the Pomp Party! Pinning! Great post. I was checking continuously this weblog and I am inspired! Extremely helpful info specifically the remaining phase 🙂 I maintain such information a lot. I was seeking this particular information for a very long time. Thank you and best of luck.